I do not understand. I am at the PHP London Conference – yes, you guessed it – at the Business Design Centre in Islington. On Friday morning it feels completely reasonable to get there early and make sure the stand looks good and everything is ready for the onslaught. But why do I have to be there at 8am on Saturday morning? Why do they let everybody in so early when I could still be in bed… I suppose my role is not to question. There is no need to describe Rasmus, we all know that he is the person behind the PHP project that he got off the ground in 1995. A friend from Sofia and a long-time WordPress contributor working for Automattic who also teaches at Sofia University, but most importantly – he has got a bear! Ian is the development manager at Virgin Management in London – and you can be pretty sure that if you go to a PHP conference, you will meet Ian as one of the key speakers. After talking to Andrew for 5 mins he reminded me that we knew each other – we met at Maker Faire, Newcastle… he was the man strolling around with a pram mounted with a kind of tank pointing to the crowd. All very inoffensive but fun. Inside the pram there was his very young son who had the most wonderful giggle – a very sunny little boy. Yet another well travelled person with lots of speaking commitments – PHP Barcelona, PHPNW and many more. Derick has contributed in a number of PHP projects including the Xdebug, the mcrypt, etc. 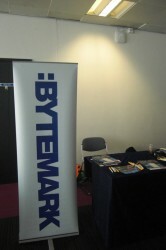 Bytemark Hosting is known as the “geek hosting outfit of choice” for UK hosting since 2002, run by programmer Matthew Bloch and network engineer, Peter Taphouse. Infobright – a new high performance, self-tuning analytic database created by four academics from Warsaw University about 6 years ago. 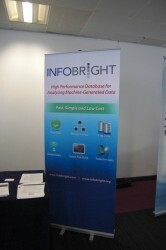 I am hoping that somebody from Infobright will write a post in the near future. Of course I should have started this listing with the platinum sponsor: Automattic, without whom you would not be reading this post. Also, thank you Automatic for bringing us so much colour through your stand. 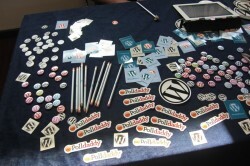 There were many more sponsors that you can find on the PHP Conference 2012 website. 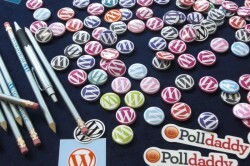 Lots of the companies came to PHP London in view of fulfilling some vacancies for good PHP Programmers – apparently they are very difficult to find. So if you are good and looking for a new job, have a look at the PHP market. … and what about the organisers? John Le Drew, antz29 Ltd – he can be found on Twitter at @antz29, Facebo and LinkedIn. Thank you guys for putting up such a great show! I am sure you spent many evenings working on this event and wondering why you were doing it. Now we know why!